Hello fashion geeks! The fashion industry is dynamic! Different attires, styles and designs are now strutting the African fashion run way. 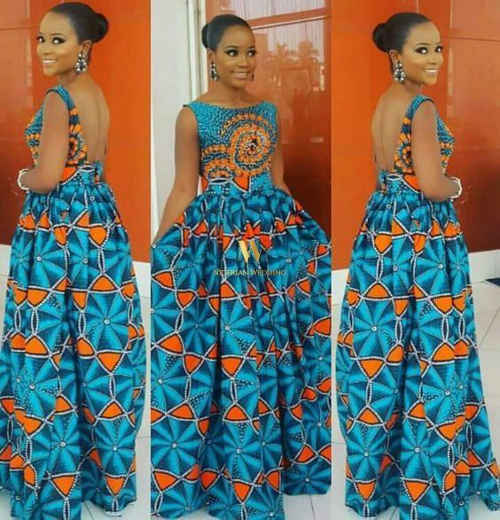 In this post, we have gathered some of the most fascinating and classy styles to keep you abreast of the latest trends in Ankara dresses. Trust, these tips will help you scale your style. 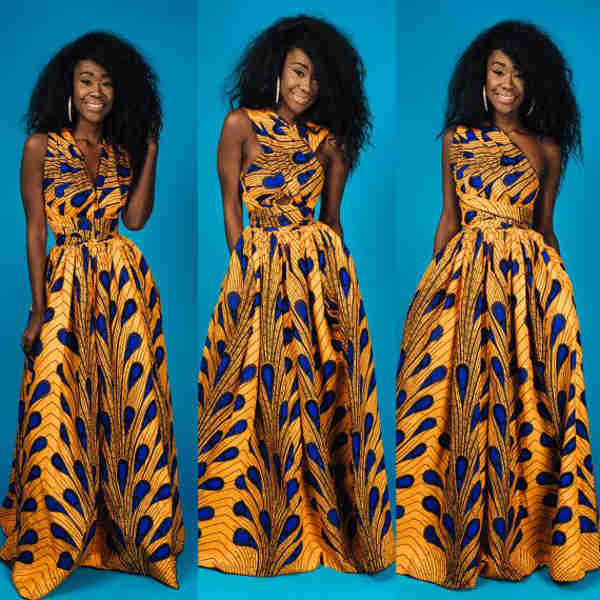 We present to you some of the most unique and latest trends in Ankara fashion. A wrap dress is one in which one side is wrapped over the other, thus forming a closure and a medium to long V-neckline. Many thick Ankara fabrics are highly suited for various designs and styles of wrap dresses. A high-low blouse is designed with full circular helm in which the front is mostly shorter than the back. High-low dresses are perfectly ideal for reliving the awe of the victorian era fashion. Many styles of high-low blowse feature seamless back zip. Maxi dresses are either floor length or ankle long. The distinct characteristic is the fact that the top is mostly fitting while the helm is cut loose and free-flowing. Nevertheless, Maxi dresses are not limited as regards to choice of pattern, color or neckline specifications. Sometimes called convertible dress. What is so special about infinit dresses? Versatility! Infinity dresses are specially designed in such a way that you can convert them into a range of different dresses and designs. Many Convertible dresses can be converted into more than six different dresses. Here is a short video on how to convert an infinite dress to a wide range of styles. This morning due dress is a great choice to stock your cupboard with for a simply cozy look. It comes with two side pockets. The absense of lining is probably makes it ideal for such times when you need to free off the heat. Dashiki is a West African traditional fabric, highly fancied for its rich colors and patterns. Dashiki styles and dresses are fast becoming Africa's top fashion exports to the world. Like Ankara dresses, modern dashiki dresses are ideal for formal and informal outings – depending on the design. Dashiki Jacket is perfect for any informal outings – Weddings, Naming ceremonies, Birthday or Dinner parties etc. A crop top [ half shirt, belly shirt or midriff shirt ] is a short top with a very high helm, meant to draw attention to the wearer's waist, navels or any other prominent parts of the midriff. A short top however can feature a wide range of other design or style specifications. Many crop tops feature V-neck, cold “shoulder design” and a back zipper. 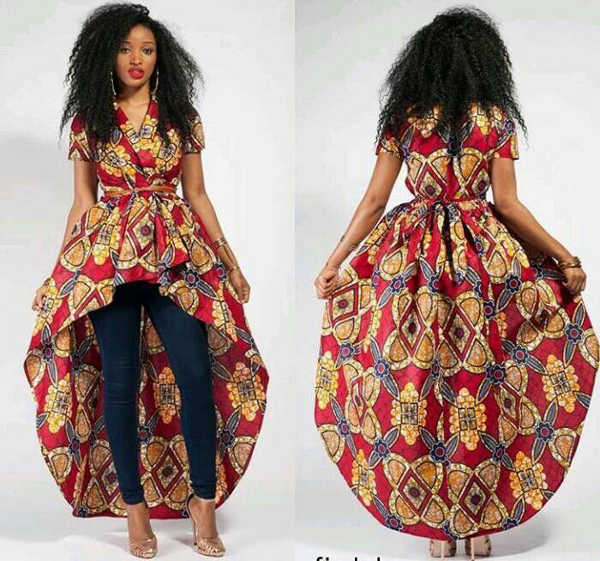 Related: Maternity gowns sewn with ankara – The top 5 styles. Many butterfly-themed dresses come off as highly glamorous designs and ideal as evening wears. Many luxurious butterfly dresses are mostly made of lush fabrics; lace, velvet, chiffons or silk. Such butterfly dresses are mostly floor length – but exception certainly exists. This Ankara dress is a short butterfly-themed dress that can be worn with short denims or pants. Trench coat dresses are water proof dresses of poplin, leather or cotton garbadine materials for rainy or snowy conditions. What about a trench coat made of highly patterned ankara fabric? This classy design featured above is one of such. It can be worn as just an everyday coat or as open top with a fitted denim or pants.